Ah it is the year of the Taiga Tiger ^^; So this is the first doodle of the year ^o^! I hope all of you have a fantastic 2010!!! Happy New Year!! I somehow feel that there *should* be a ToraDora OVA or something this year. Nice sketch of Minorin and Taiga. Although Taiga’s expression is somehow weird.. funny? happy new year! will be a good one since it is year of the taiga! 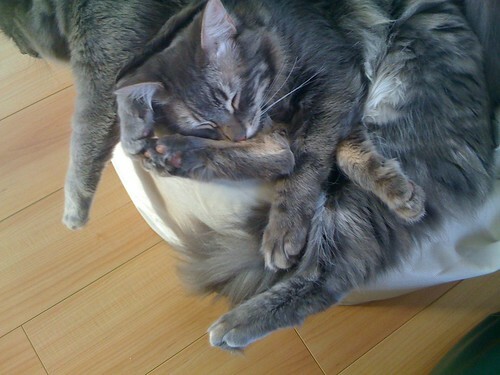 very cute pic ^^ lots of fur, arms, and legs there. kitties are so lovey, mine have their chalk line drawn on the ground! cute design for the fabric every girl loves ponies! Oh! I just realised. Is that the expression of your nendo Taiga? hehehe thanks Gordon! :) Wish you a fantastic mew year too ;P! awwww how cute to have chalk line of them drawn on the ground :) our kids are still young and fidgety if we tried to draw anything around them they’ll move or try to catch it XD! yes yes! hehe miniature taigas :3 LOL Happy 2010!!! 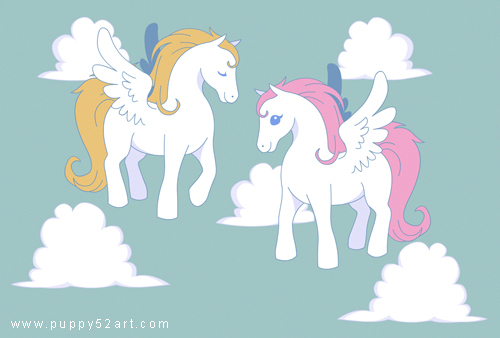 The spoonflower submission reminds me of My Little Pony. Great work! I guess I really liked Toradora! And it is my anime of 2009 ;)! Do U mean like on zazzle?